Whether you are trying to stay fit as a desk jockey or simply incorporate more activity into your life, the proper gear choices can make or break your budget. Here are my frugal faves when it comes to working out for less money. Available for a buck at most dollar stores and not much more elsewhere, foam pool “noodles” can be used for aquatic fitness moves that strengthen the abdomen, work your inner thigh muscles and even provide arm toning support. They are one of my favorite frugal fitness resources, and bring the added benefit of being able to be used for family fun in the sun. There’s nothing like a good float and splash session with the kiddos. If you’re having trouble maintaining your travel workout on the road due to unpredictable fitness amenity access, consider the use of power bands in your exercise routine. They take up minimal space, can be used anywhere, and make up for the lack of weight availability when you’re trying to adhere to carry-on baggage limitations. A basic straight-back chair can provide a leverage point from which you can perform arm pushups, maintain balance for leg stretches and even try your hand at modified pushups. When not in use, the chair can be returned to your dining table, making it less obtrusive than regular fitness apparatuses. Well, technically any stairs will do. But if you find yourself in a pinch and need a quick workout on a rainy day, you can hit the stairwell at your hotel. In addition to the expected up and down journeys, one of my favorite exercise tips for travelers is to go up and down the stairs sideways, facing a different direction each time. This works outer thigh muscles as well, providing a more overall toning effort that won’t require additional time away from your work or vacation schedule. These typically on sale several times per year, although you can always count on major discounts during the month of August, when back-to-school savings events are going on wherever you look. Let’s face it. 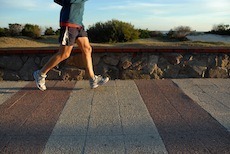 Walking, jogging and hiking are some of the most inexpensive fitness activities you’ll find. They can be worked into a family camping trip, or in the case of hiking make for an affordable nature getaway in and of itself. Children and adults both can get antsy during the colder months so it helps to have a few family activities for winter up your sleeve for school vacations and regular weekends. One year, my husband and I ordered ourselves snow sneakers along with his and her snowshoe kits for Christmas. The kits had the snowshoes, poles and a zippered carrying case for both. They stored easily on our porch’s wall hooks and made for an easy outdoor activity when the main roads were impassible after a storm. It also doesn’t hurt that snowshoeing is an affordable holiday, shaving significant dollars off the cost of a typical ski vacation. These are some of my favorite pieces of inexpensive fitness gear. What are yours? Do we have any yoga fans in the audience? If so, what do you consider to be the basic equipment necessary for beginners? I’d say having a pull-up bar that you can install in a doorway should be included as well. Other good additions would be a jump rope, and push up bars. A park, you can walk/run, do pull ups on the monkey bars, swing, etc. Great article, thanks! Has anyone here tried Power Yoga as a form of exercise? I’ve heard great things about it and have started to incorporate it into my exercise routines. All I need is a yoga mat. I know there’s a bunch out of videos out there, but I’ve been using online workouts by Mark Gonzales. I love his workouts! If anyone has any other recommendations, please let me know!